UPDATE: Saving Carson Shelter Dogs writes that Cutie has been "rescued," though there's no word yet whether she's found a forever home. Cutie is a 15-year-old German shepherd mix who has lived a long life, and just wants a peaceful home to relax in and enjoy her old age. 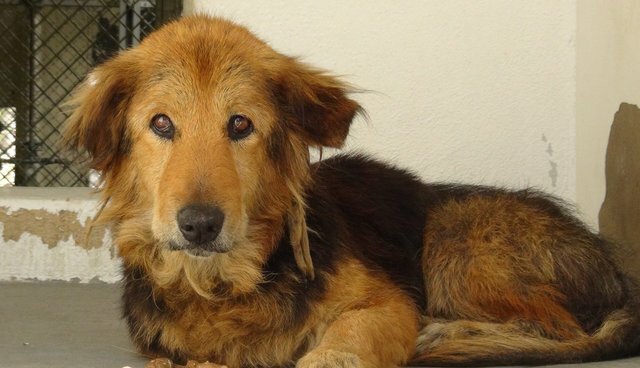 She had a home - but her family decided they no longer had time for this sweet senior dog, so they left her at a shelter. Cutie was surrendered to the Carson Animal Shelter, a high-kill shelter in California, on Wednesday. Cutie is already a super senior, so her chances of being adopted are pretty slim, and now her life is in danger. A Facebook group called Saving Carson Shelter Dogs is trying to help Cutie in the fight for her life. They posted a video of Cutie in her enclosure at the shelter. It is clear that she is confused and disoriented - and just wants, more than anything, to go home. Cutie doesn't have much time left unless someone steps up to be her new forever family. If you might be able to take her in, contact the Carson Animal Shelter at 310-523-9566, or inquire through the Saving Carson Shelter Dogs page.